Keeping it simple may seem pretty, well, simple for the average human being, but for us alcoholics and addicts, it can be anything but. We just have a way of complicating the most uncomplicated things. Things like: working, driving and even food shopping become daunting because that’s what we do. Where this becomes a danger is when we complicate our sobriety. Complicating life complicates our sobriety. When I first got sober, I did not keep it simple. I would create drama, over-analyze things and make problems out to be bigger than they actually were. I was still stuck in the, “Poor me, look what I have to deal with! Why can’t everything just be easy?” phase. Living life on life’s terms is definitely a struggle for someone who always escaped with drugs and alcohol. The reality of an active alcoholic/addict is that they abhor reality. The cycle is: we screw up, we get drunk, we feel resentment, we screw up, we get drunk and we wind up doing dumb stuff. I am no longer new to sobriety, and yeah, in the beginning I was trying to hold onto the old way of thinking (complicated) while maintaining my sobriety. When I realized keeping things simple made my life simple, I started catching on. Keeping it simple isn’t just for people in recovery. What are some ways you keep it simple? That is so fascinating! You should create curriculum for every high school based on those two types of behavior types. The screw up-get drunk model is absolutely foreign to me. And that is not to say I don’t screw up. I think I screw-up, feel embarrassed/sad, grieve, move on. So I guess I build I the breaks there but just in general, as a reward. Do something awesome, feel good, feel proud, take some time for me. So. Maybe I buy a pair of shoes. Or schedule or girlie luncheon. Or get a pedicure. Or watch some guilty TV. But I do reward myself. When my computer crashed, I realized I was feeling stupid. Filling the air with “I should haves”. I wasn’t very nice to my family. I’d just lost so much. People kept telling me what I could have done. Sooo not helpful. And I retreated. But I’m out of my cocoon now, still without a computer, but writing with a pen and paper — and enjoying the end of summer sun. And not feeling guilty. Yay Renée! I am glad you made the best of it and persevered… 😀 The screw up drunk model was at one time foreign to me… that is until I realized I was one! lol.. Yes, I am laughing… what else can I do? 😉 Thanks so much for stopping by, Renée. Trust me, it’s not just alcoholics or narcotics users. It is the nature of the human mind to keep us wrapped up in itself. You are just more honest about it. The greatest addiction there ever has been is our addiction to the notion of who we are. The problem starts there. good advice, sober or not… trying to keep it simple this weekend… it feels good but Monday’s gonna slap me in the face and I’ll get done what i have time for and worry less, but for right now slowin’ down feels good, feels right….. Slowing down is always a great thing for me to do. There is just so much these days! Hope Monday didn’t slap you too hard… Enjoy your week, Clay. Especially the plan ahead part. So often we don’t leave any margin in our lives and end up scrambling and frazzled. 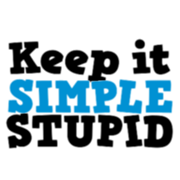 Your ways to keep it simple should really help prevent that. Hey Gina… I’m good at complicating things.. so this phrase does me well.. 😉 Enjoy the rest of your week. I love your posts, Darlene 🙂 I’m very bad at keeping it simple when I’m doing something, but I do tend to see straight through to the heart of the matter when it comes to so many things. Makes me crazy when I see just how much people (including me) complicate simple things. Having ‘k.i.s.s’ to fall back on–and to increase my awareness of when I’m over-multi-tasking helps. Take care and ttys! Sounds good, blogger-pal. Take care and you do the same! Hi Engelia… thanks so much for reading and I am glad you were able to get something out of this post.. Have a blessed day! Good morning… I am so happy that you took some good things from this post… I think planning ahead is underrated!! 😉 have an amazing day!